Rupert Pupkin Speaks: Favorite Underrated Dramas - Jason Hyde ""
Charlie Chaplin's superb drama caused a lot of head-scratching and famously flopped in its day, but proved very influential in the years since its release. Michael Powell was an admirer, and it Ernst Lubitsch cited it as a direct influence. It also was the film that really established Adolphe Menjou's image as the impeccably-dressed rake, and any movie that does that has to be worthwhile. One thing it didn't do was establish Edna Purviance as a leading lady outside of Chaplin comedies. And that's a shame, because she's really great in this film. In fact, everything about A Woman of Paris is great. It's beautifully shot, incredibly well-written, and has a tone that's surprisingly modern and unsentimental for Chaplin at this stage of his career. But it most definitely was not what audiences wanted from Charlie Chaplin in 1923, and he stayed away from drama until Limelight nearly 30 years later. Edna Purviance remained on Chaplin's payroll until her death in 1958, but never starred in another film that anybody saw. Chaplin produced a second film for her called A Woman of the Sea, directed by Josef von Sternberg, but it was apparently destroyed before it was released. 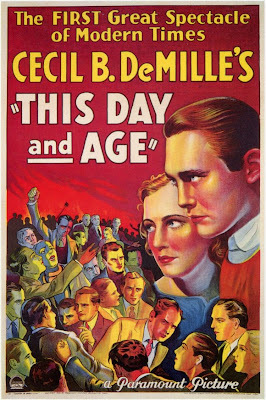 Gloriously bonkers backstage melodrama from James Cruze starring the incomparable Erich von Stroheim at his most unhinged. Stroheim plays the title character, an ill-tempered, domineering, struggling ventriloquist whose shabby treatment of his wife drives her away from him. Afterwards, they both achieve success on their own and end up playing the same big revue show. Gabbo hopes to re-unite with her and tries to woo her through his dummy Otto. It does not go well. 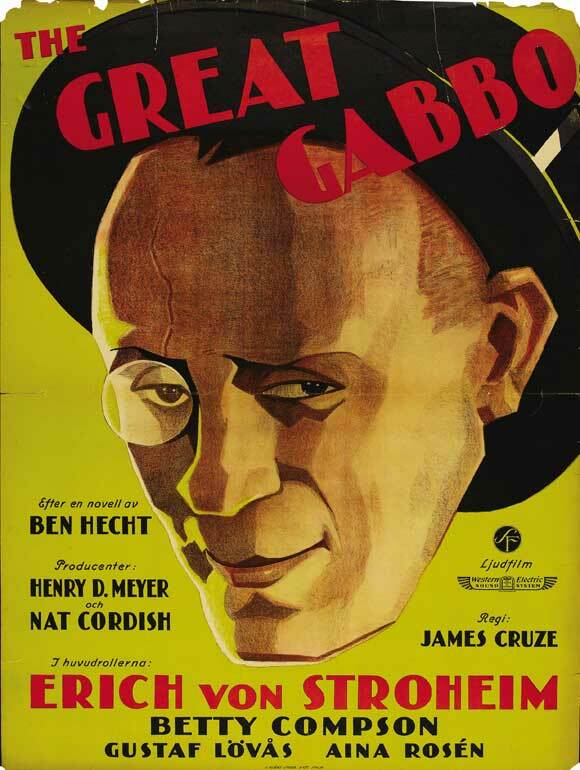 There's a definite strangeness to a lot early talkies from this period, but even keeping that in mind, The Great Gabbo is one strange movie, featuring great chunks of untranslated German, lots of scenes that stick around just a bit too long, and some seriously bizarre musical numbers. The spider-themed "Caught in the Web of Love" number has to be seen to be believed. Then there's Otto's song about dropping his lollipop on the ground, with its catchy refrain of 'All oooover icky" that will stay with you for days. The musical numbers were originally shot in color, but only exist now in black and white. What I wouldn't give to get my hands on that footage. I've never had much time for Cecil B. DeMill's epics. They have their moments, but I've always found most of them pretty flat and not terribly engaging. However, I have lots of time for DeMille's Madame Satan, with its decadent party aboard a crashing Zeppelin finale. And I have even more time for This Day and Age, in which a group of high school boys, led by Richard Cromwell, learn just how inefficient their local justice system is during a Boys Week project. They want justice for a murdered friend, but the local crime boss has everything rigged in his favor. So they form their own vigilante squad and take the law into their own hands in a big way, kidnapping the crime boss and dangling him over a pit of live rats. These kids do not mess around. It's a bit like watching The Bowery Boys turn into Charles Bronson. This Day and Age is admittedly a bit of an idealogical mess, but I'd be lying if I said that it didn't make vigilante justice look like a load of fun. Jack Webb is mostly remembered for his groundbreaking radio and TV work, but all of his films are worth your time. 1954's Dragnet film predictably gets the most attention, but Webb's real masterpiece is this story of jazz musicians getting mixed up with organized crime in 1920s Kansas City. 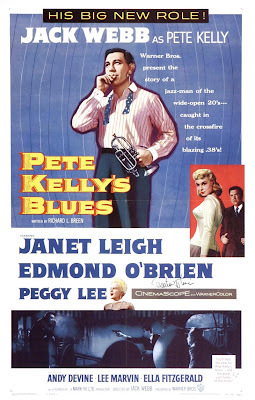 Like Dragnet, Pete Kelly's Blues was also a radio show and a TV show, but unlike Dragnet it wasn't a hit in any format, and the film version has never really found much of an audience, which is really sad when you consider what it's got going for it. Webb was a lifelong jazz fanatic, so Pete Kelly's Blues is filled with terrific music. It's also got gorgeous costumes and Technicolor photography and some fine performances from actors like Lee Marvin, Andy Devine (very different from his usual comical western sidekick shtick), Janet Leigh, and the always-brilliant Edmond O'Brien. But the best work is turned in by singer Peggy Lee in her film debut as a troubled singer forced on Webb's band by O'Brien's gangster. Lee was nominated for an Oscar and really deserved to win. If I have a gripe with Pete Kelly's Blues, it's that Jack Webb himself is occasionally a bit too stiff in the title role. Every time I watch this one, I find myself wondering what it would be like if Webb and Lee Marvin had switched roles. It's not that Webb's bad, but Lee Marvin is Lee Marvin, and the movie could use a bit more of him. A genuine masterpiece from director Robert Rossen, from those long-ago days when major studio films were getting all arty and French New Wave-influenced (see also: John Frankenheimer's Seconds). 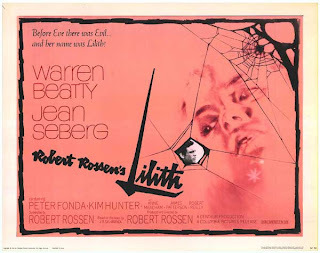 Warren Beatty does his best Brando as an ex-soldier who goes to work at a secluded and exclusive sanatarium where he meets and falls for a very disturbed woman played by Jean Seberg, who is incredible. Their relationship is a rocky one, to say the least. Also on hand, in probably his best performance, is Peter Fonda as another patient under Lilith's spell, as well as a young Gene Hackman and Kim Hunter. Plus there's a haunting jazz score by the underrated Kenyon Hopkins, luminous cinematography that's not so much black and white as many shades of grey and white, and lots of memorably arty flourishes (hand-held camerawork, ambiguous ending). This is simply one of the most beautiful and unsettling films I've ever seen. The Bowery Boys turn into Charles Bronson! Whoa! 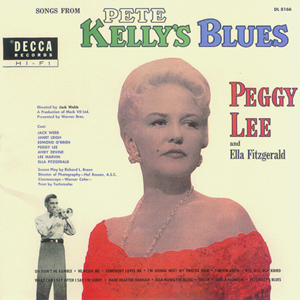 Pete Kelly's Blues looks ideal. Queued right up. Ditto on LILITH. A superb film.